A calendar, whether paper or digital, is one of the most important and valuable tools you can learn to utilize to work for you. I used to be a big fan of paper calendars and day timers (until I learned how to effectively use the iCal app) and have religiously used a calendar since I was in high school. My iCal is currently my second brain. Or, maybe my first. Learning how to use iCal has made scheduling so simple and easy for me. Syncing my iCal between my phone, iPad, laptop and desktop makes me one happy chimp. No matter where I am, I can hop on my calendar and schedule something. 1] Always check your calendar before scheduling an appointment. This will save you time by avoiding double bookings and having to go back and reschedule. 2] Keep your calendar handy at all times. Unfortunately, jotting something down on a grocery receipt does not put it on the calendar. 3] Schedule everything. When it’s on your calendar, it’s on your radar. It gets done. When I want to spend an hour in one of the girls’s classroom, I put it on my calendar. Otherwise, it doesn’t happen. Schedule those priorities. I even schedule my time blocks. 4] As you schedule your day, don’t forget to allow for travel time as well as reasonable cushions of space between appointments to allow for unexpected delays, etc. 5] Be sure to schedule in a bit of time for yourself. Time at the gym, time to read for pleasure, time to spend with a friend, time to meditate, time for your hobby, etc. 6] Dedicate some time to prioritize and think about what you want to invest your time in. 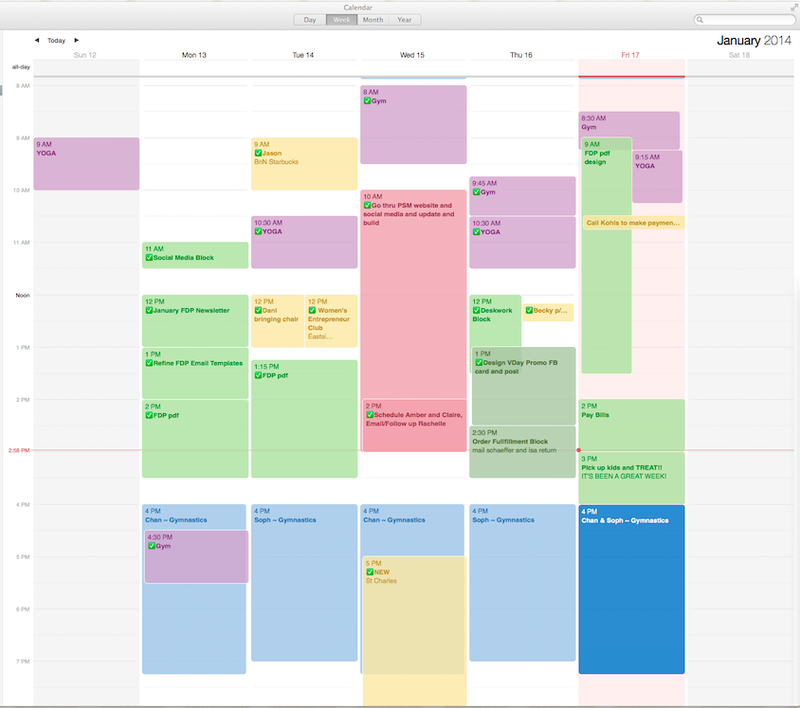 This will help you avoid putting items on your calendar that you really don’t want to do. In other words, it will help you know when to say no. 7] Spend some time Sunday afternoon or evening planning the coming week, entering the details on your calendar. Consider your priorities, the kid’s activities, late evening/early morning appointments, etc. 8] Every evening look over your schedule for the next day to mentally prepare for success and to avoid missing any early morning appointments. 9] Set alerts for the unusual items that you tend to overlook. Be selective with the alerts you set. Too many alerts going off all day, will be easy to tune out. 10] Color code different categories of appointments so that you can see at a glance what type of appointment is up next. I am finding that by managing my calendar, my calendar actually gives back to me. Who doesn’t love 15 extra mins before the kids get off the bus to decompress and switch gears for the evening? Or, to share a cupcake and a cup of coffee with your sister? Talk to me. Do you use a paper or a digital calendar? What are your tips and tricks for calendar success? Comment below.